Exciting news! 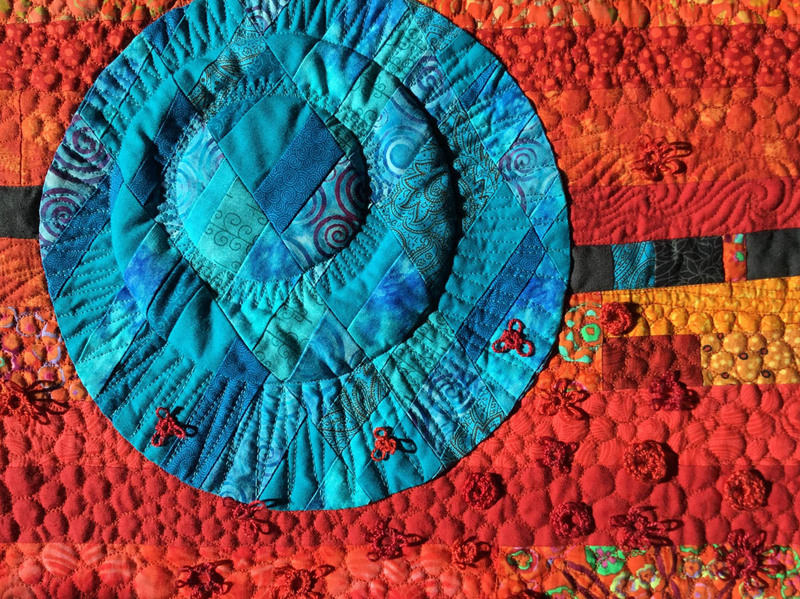 I've been invited to be the Guest Artist at a quilt exhibit to launch the opening of the new facility of the Murray Arts Council [MAC] in Chatsworth, Georgia. at the Murray Arts Council Chatsworth, GA. October 14-15 and 21-22. 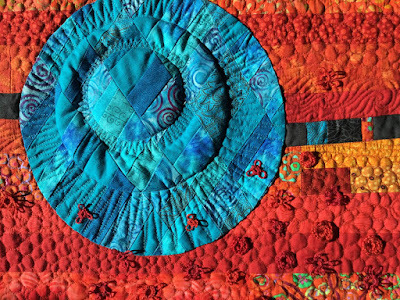 I'll have nine quilted pieces in the exhibit that will be held on two weekends in October: 14 - 15 and 21 - 22, with an opening reception on Saturday, October 14 from 1 - 3 pm. The address to the gallery is 120 N. 3rd Avenue, Chatsworth, GA (about an hour from Chattanooga). Blue Rhino Moon, 2004, 33.5" x 43"
This quilt, Blue Rhino Moon (read this quilt's back story in this blog post), is one of the nine quilted pieces that will be on display. It's an honor to be asked to be the guest artist and exciting to have a subset of my work hanging all together! When I was first asked to be the guest artist, I made a mental list of pieces I thought people might like to see. "This one has great color..." "that one shows cool quilting techniques..." "that other one incorporates interesting fabrics..." was my initial thought process. Hmmm... these really need to be curated. So, what I thought might be "fun to see" was a wee bit different from choosing pieces that would tell my story and make a cohesive showing. 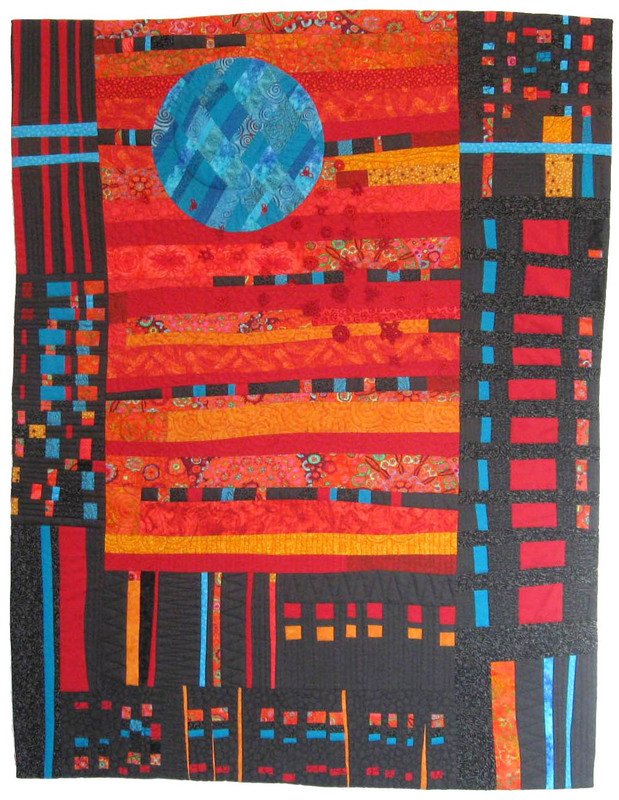 After a few auditions and edits, I feel the ultimate group of quilts is a good representation of the work I'm doing these days... (and still offers great color combos, improv patchwork, and cool free-motion quilting). So, You're Invited to the Quilt Show! And I hope you can come to this special exhibit. I'm planning to attend the opening reception to help celebrate MAC's new facility and would love to chat about quilts and quilting with you. 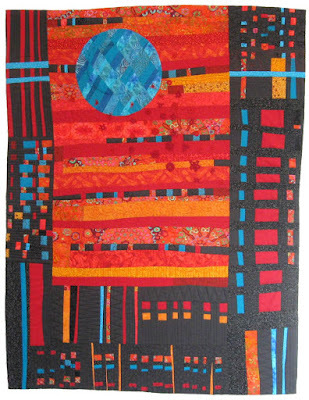 In addition to my pieces, there will be other quilts at the exhibit made by local quiltmakers. Waooo! How appropriate to choose you as the Guest Artist. I hope to make it to the show. Thanks, Cristy. I hope you can come.